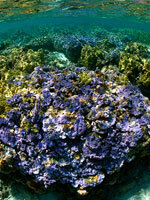 The blue rice coral is part of NOAA's only large, multi-species petition under the Endangered Species Act, while the Fish and Wildlife Service has faced several lawsuits demanding protection for hundreds of species at a time. Photo courtesy of James Watt/NOAA. The Obama administration's proposal to move the government's oceans agency into the Interior Department would unite two federal bureaus that have had markedly different approaches to endangered species management, onlookers say. President Obama proposed the change last month, as part of a broader reorganization of the executive branch. Under the proposal, Obama would consolidate six agencies into one and move the entire National Oceanic and Atmospheric Administration from the Commerce Department to the Interior Department. The shift is intended to improve government efficiency, merging agencies with similar missions and cutting some $3 billion in federal spending, according to the White House. One of the key areas of overlap for NOAA and Interior is their work on endangered species. The National Marine Fisheries Service oversees marine species -- including whales, salmon, sturgeon and corals -- while the Fish and Wildlife Service governs protected plants and animals on land, ranging from small plants like the Lane Mountain milk vetch to the roaming Grizzly bear.